Speed is inversely proportional to flux. So by varying flux, we can change the speed of the motor. In this method, a variable resistance (known as shunt field rheostat) is placed in series with shunt field winding. The field rheostat reduces the shunt field current Ish. So the flux also gets reduced. There the speed can be raised above normal speed as shown in the figure. Generally, this method permits to increase the speed in the ratio 3:1. Wider speed ranges tend to produce instability and poor commutation. The concept behind this method is that the back emf and the speed of the motor can be changed by varying the voltage across armature V.
A variable resistance Rc ( controller resistance ) is placed in series with the armature as shown in the figure. Since Rc is introduced, the voltage drop is increased and hence back emf [Eb = V – IaRa] decreases. Also N ∝ Eb, therefore speed decreases. The highest speed is when Rc=0 i.e, normal speed. Hence, this method can only provide speeds below the normal speed. There are some disadvantages for flux control method and armature control method such as poor speed regulation and poor efficiency. Voltage control method overcome these problems. In this method, the voltage source supplying the field current is different from that which supplies the armature. This method is used for large size motors since it is very expensive. In this method, the shunt field of the motor is connected permanently across a-fixed voltage source. The armature can be connected across several different voltages through a suitable switchgear. In this way, voltage applied across the armature can be changed. The speed will be approximately proportional to the voltage applied across the armature. Intermediate speeds can be obtained by means of a shunt field regulator. Adjustable voltage is obtained from the system shown in below diagram. 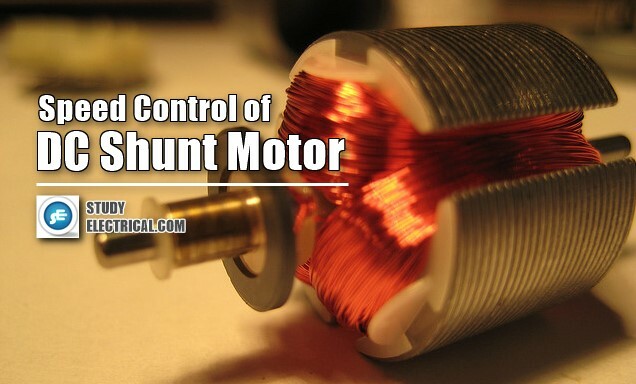 The armature of the shunt motor M (whose speed is to be controlled) is connected directly to a d.c. generator G driven by a constant-speed a.c. motor A. The field of the shunt motor is supplied from a constant-voltage exciter E. The field of the generator G is also supplied from the exciter E.
The voltage of the generator G can be varied by means of its field regulator. By reversing the field current of generator G by controller Fc, the voltage applied to the motor may be reversed. Sometimes, a field regulator is included in the field circuit of shunt motor M for additional speed adjustment. With this method, the motor may be operated at any speed upto its maximum speed.